I'm in Oregon, about to put on Philosophy Talk live on three college campuses on three consecutive nights -- what we've dubbed the "Have Thought, Will Travel: Oregon Trail 2012 Tour." But I digress. What I'm really excited about is this week's Fog City Blues. Since I'm away, it'll be a pre-recorded program I produced after interviewing one of my favorite groups of late, the Carolina Chocolate Drops -- a multi-instrumental string band blending old and new in some seriously infectious ways. Fun fact: one member of the band and I share an alma mater in Oberlin College (along with a couple of members of our own California Honeydrops -- what's up with Obies and their band names?). In any case, the Chocolate Drops played a couple of their bluesier tunes live in the studio (one of which we played on the air last week), talked about some other songs on their new album Leaving Eden, and generally made it a terrific way (for me) to spend a Sunday morning in between their Bay Area gigs. Tune in Wednesday at 9pm to hear the band and their music, or check it out after the broadcast at KALW's Local Music Player. Speaking of local music, earlier this year the program celebrated five years on the air, and next month we're taking that anniversary to the stage. 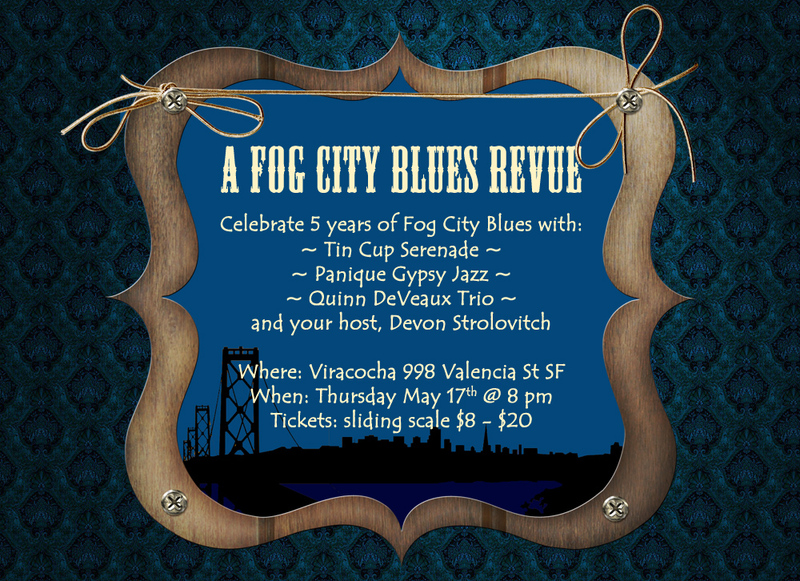 On Thursday May 17 it's a Fog City Blues 5th Anniversary Revue at Viracocha in San Francisco, featuring live music form some great friends of the show: Tin Cup Serenade, Panique Gypsy Jazz, and the Quinn DeVeaux Trio. This is a kind of event I've been thinking about for some time (the initial spark coming from my wife Andrea). It's a great way to bring the show out from behind the radio microphone. Local Bay Area musicians have been a major inspiration in putting together the show each week, not least when they come perform live on the air -- a pure privilege for me to enjoy from right across the control board. 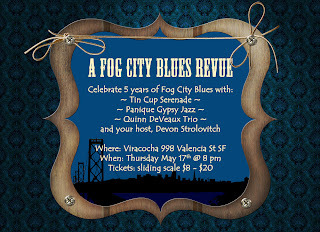 So I hope you and yours will join us at a great San Francisco venue for an evening of some of the best Fog City Blues. from the new album Jewish Blues Vol.III: T'filah!